Definition at line 141 of file llvoavatar.h. Definition at line 158 of file llvoavatar.h. Definition at line 145 of file llvoavatar.h. Definition at line 147 of file llvoavatar.h. Definition at line 152 of file llvoavatar.h. Definition at line 153 of file llvoavatar.h. Definition at line 8827 of file llvoavatar.cpp. References LLXmlTree::addAttributeString(), FALSE, LLXmlTreeNode::getFastAttributeS32(), LLXmlTreeNode::getFirstChild(), LLXmlTreeNode::getNextChild(), llendl, llwarns, mBoneInfoList, mNumBones, mNumCollisionVolumes, and TRUE. Definition at line 143 of file llvoavatar.h. Definition at line 159 of file llvoavatar.h. 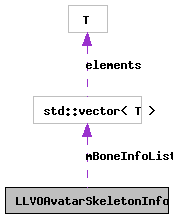 Referenced by LLVOAvatar::buildSkeleton(), parseXml(), and ~LLVOAvatarSkeletonInfo(). Definition at line 156 of file llvoavatar.h. Referenced by LLVOAvatar::buildSkeleton(), getNumBones(), and parseXml(). Definition at line 157 of file llvoavatar.h. Referenced by LLVOAvatar::buildSkeleton(), getNumCollisionVolumes(), and parseXml().